The rates of anxiety and depression in our society are growing. Some believe the rise in cases is about increased awareness — more people are seeking help because there is more information about these problems and how they affect us. Some believe that the increased number of cases is tied to our hectic, modern lifestyle that encourages us to work far more hours than we should and detaches us from our friends and family and the things that bring us joy. Fortunately, there are many ways to treat anxiety and depression. Some people find success with lifestyle changes, such as getting more sleep, exercising regularly, and eating a healthier diet. Practices like meditation and mindfulness-based stress reduction can also help. Of course, medications like antidepressants and psychotherapy can also prove effective. More and more people are finding that “alternative” therapies like acupuncture are providing to be just as effective if not more so than these traditional therapies.! Acupuncture has its roots in Chinese medicine. It aims to balance the flow of energy, known as Qi (pronounced “she”), in the body. Qi travels down meridian, or pathways, in the body, and acupuncture works to open up those pathways and allow the free flow of energy. If you have too much earth represented in your body, you may feel more anxiety. If metal or wood are overly represented, you might feel depressed. The balance can be complicated and different for each person. Your Mesa acupuncturist will determine the right pathways to stimulate based on your intake and the symptoms you describe. Anxiety can also produce severe behavioral changes, such as aggression, impulsivity, and even self-harm. Anxiety can be the result of trauma, or it can be a combination of personality and genetic traits. It can be experienced as general anxiety, or it can be associated with specific issues or situations, such as social anxiety. The type of anxiety and the symptoms experienced will determine the type of treatment needed. Typically, acupuncture treatments will focus on stimulating points around the heart, kidney and spleen, which is aimed at balancing joy (represented by the heart) and fear (represented by the kidney and spleen). Small needles will be placed on the meridians that govern these areas of the body to unblock the flow of energy. As many as 1 in 5 people will experience depression at least once in their lifetime. Depression is more than just feeling sad after something bad happens, like losing a loved one or getting divorced. It is an intense state that involves emotional, mental and physical changes, and it can last for an extended period — years, in some cases. Depression affects more than mood. It can cause intense exhaustion, impair your ability to concentrate, negatively affect memory, and cause you to overeat or oversleep (or to get too little to eat or too little sleep). Like anxiety, depression can result in serious consequences if left untreated, including self-harm. Chinese medicine believes that depression can be the result of an imbalance in energy in the body. Acupuncture treatments for depression typically focus on stimulating the liver, which is primarily responsible for circulating Qi. The heart and spleen are also stimulated to support the work of the liver. In many cases, depression and anxiety go hand in hand, so the acupuncturist would develop a course of treatment that would address the overlapping issues. Some studies have shown that acupuncture treatments can be just as effective as medication and psychotherapy, depending on the individual and the frequency of treatment. You may also need to combine acupuncture with other treatments, such as chiropractic care, which will align the spine to help further encourage the free flow of energy. At BodyWorkz in Mesa, you can receive effective chiropractic treatments, pain-relieving massage therapy and learn more about the benefits of acupuncture for your ultimate health and wellness experience. You can work with an acupuncture chiropractor who can provide a combined therapy, or you can focus on just acupuncture treatments or another type of treatment. Our providers focus on finding the right treatments for each individual to provide relief. In addition to treating anxiety and depression, our providers treat a range of issues such as chronic pain, chronic fatigue, stress, and more. 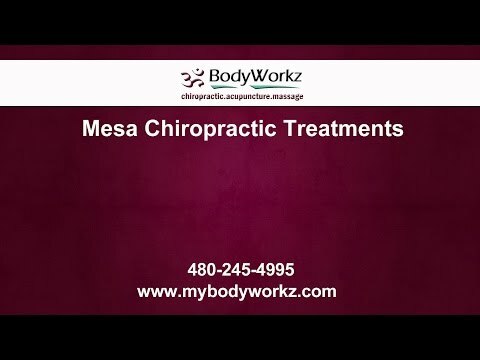 Visit us in Mesa or one of our other location to see an acupuncture chiropractor or another provider to develop a personalized treatment plan.